✔The perfect PAIN RELIEF device by sending electrical pulses through electrodes placed on the skin to underlying nerve fibers,it can help to ease the sub-health, relieve tiredness and shoulder tension, improve sleeping quality and activate collaterals to relief your body pain. ✔People with back pain, arthritic or inflamed discs/ joints, shoulder tension and many more injuries and disabilities would benefit from the units relaxation and release of tension. ✔Pocket size, portable and convenient:relax any time! Anywhere! Total body relaxation: Make this the most powerful weapon in your fight against chronic pain. ✔Simultaneous dual output design, 8 pcs of self adhesive conductive reusable pads , replaceable self-adhesive conductive gel pads, allows 6 pads to be applied to the two different targeted areas at the same time.Extra bonus: free 2 large pads. 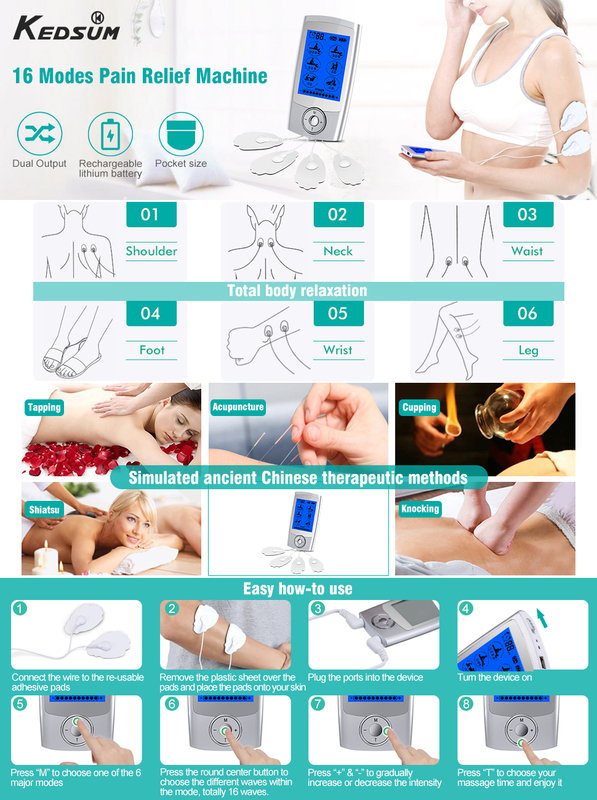 ✔16 preprogrammed massage modes, Acupuncture,Cupping,Tapping,Shiatsu Deep,Sensitive Parts Massage Mode. 2-4 massage methods under each mode. ✔Adjustable 10-60 minute timer by using "T" button,default timer: 20 minutes. 20 levels of adjustable intensity/strength. ✔Easy to read animated backlit LCD Display,better view of the screen especially at night or in the dark light. Rechargeable internal lithium battery - up to 10 hours of continuous use. 2.The "T" cycles through times from 10-60 minutes, and the "+ & -" change the pulse strength. Every time you change modes, the strength resets to the minimum which make sense because you don’t want to accidentally start with the strong or the high mode. 1. Use the pads only on normal, healthy, clean and dry skin. 2. Not suitable for babies, infants, pregnant women, hypertension patients, people with skin problems, people who recently undergone a surgical procedure, people with cancer, women who right after giving birth, patients with suspected or diagnosed heart problems. 3. Do not use this massager over the main arteries close to your neck or throat, near the heart, directly to the heart area across the chest or on the chest, on your head or across your head. 4. Please do not use the pads on the same body part for more than 30 minutes.